Seat Height Adjustable from 13"-19"
Great Product! Looks good too!!! I am a very active person with a huge walk in shower. I was looking for something to use in the shower to make it easier to just shave my legs! 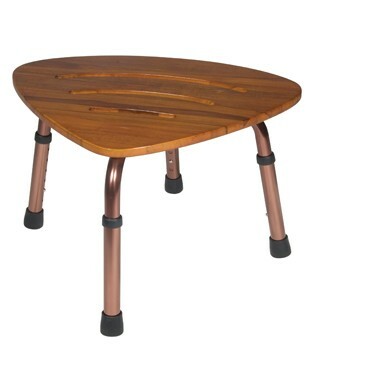 This stool is perfect and it looks great. Pros:looks like a high end piece of furniture with the teak seat. Love it... Fits in the corner and there is lots of room. Stool is much more attractive than the one it replaced. It is a little bigger than we would like, but that is b/c our shower stall is smaller than it should be.